Positioning Antipodes at dive site. Manned submersible pilot, Randy Holt, closing Antipodes’ hatch. Tony Fins (Guy Harvey Ocean Foundation) ferrying to Antipodes. Stockton Rush readies Antipodes for arrival of Dr. Steve Gittings, NOAA. Homeport for Expedition Lionfish: Nova Southeastern University’s Oceanographic Center. In foreground, Dr. Keene Haywood (Univ. of Miami, RSMAS-ABESS) and Steve Stock (Guy Harvey Ocean Foundation) with OceanGate crew in background. Dr. Steve Gittings (NOAA) and Dr. Keene Haywood (Univ. of Miami, RSMAS-ABESS) discussing research objectives. The OceanGate crew welcomes Dr. Keene Haywood (Univ. of Miami, RSMAS-ABESS) aboard Antipodes. Tony Fins (Guy Harvey Ocean Foundation), Stockton Rush/Dr.Erika Montague (OceanGate Inc) and Dr. Steve Gittings (NOAA). OceanGate’s Kenny Hague preparing Antipodes to dive. Steve Stock (Guy Harvey Ocean Foundation) aboard Antipodes receiving instruction from OceanGate’s team. Steve Stock/George Schellenger (Guy Harvey Ocean Foundation), Dr. Erika Montague (OceanGate Inc.), Dr. Keene Haywood (Univ. of Miami, RSMAS-ABESS). Dr. Keene Haywood (Univ. of Miami, RSMAS-ABESS) and Dr. Erika Montague (OceanGate, Inc.) disembarking Brownie’s Reef Roamer at Nova Southeastern University’s Oceanographic Center. Adam Nardelli (NSU), Keith Mille (FWC) and Dr. David Kerstetter (NSU) dockside prior to the day’s dives. Capt. Bob (Brownie’s) delivers safety briefing aboard Reef Roamer. Our transfer vessel, Reef Roamer, operated by expedition partner Brownie’s Yachtdiver. Dr. David Kerstetter (NSU) demonstrates lionfish fillet technique in the lab. Lionfish specimens kept in tanks for research at NSU’s labs. 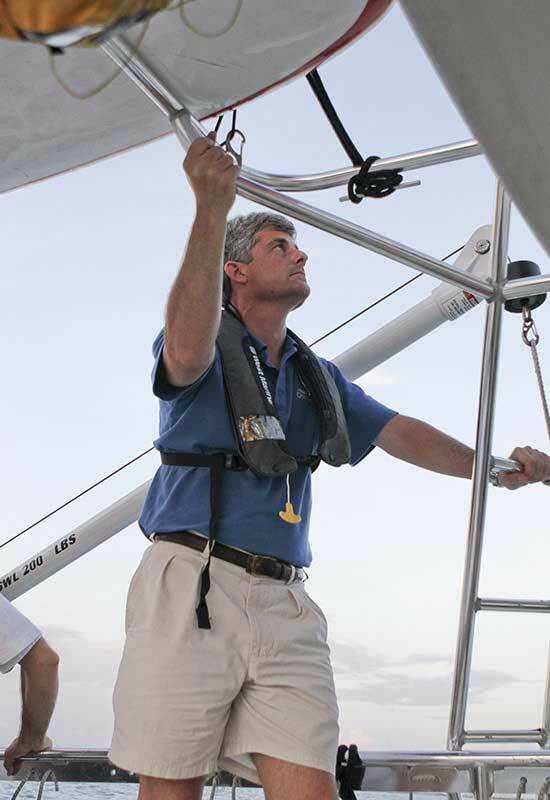 Stockton Rush, CEO, OceanGate, Inc. aboard Brownie’s Reef Roamer. George Schellenger (Guy Harvey Ocean Foundation) recording the action as the Reef Roamer divemaster, Juliana Mayhew, observes manned submersible dive operations. Dr. Erika Montague relaying information to shoreside operations. Capt. Bob of Brownie’s Reef Roamer. George Schellenger (Guy Harvey Ocean Foundation) readies camera gear. Dr. Stephanie Green, OSU/REEF, ascends the gangplank after diving in Antipodes.